I'm currently in Nelson, on my way to Christchurch tomorrow for the (yes, we're almost there at last) presentation of the inaugural Ngaio Marsh Award for Best Crime Novel. The Whodunnit and Whowunnit? event should hopefully be a terrific evening, and I'm looking forward to catching up with a few NZ-based Crime Watch readers there. Make sure you come up and say hi! Like I always do when I'm travelling, I grabbed a couple of novels to take with me to read on the plane(s) etc, and given the reason for the Christchurch leg of my few days in the South Island, I thought it was only appropriate to revisit New Zealand's Grand Dame of Crime Fiction herself, so I'm currently reading CLUTCH OF CONSTABLES by Ngaio Marsh. Ooh, love the cover of the version you've shown - is that the one you've got? Jealous! 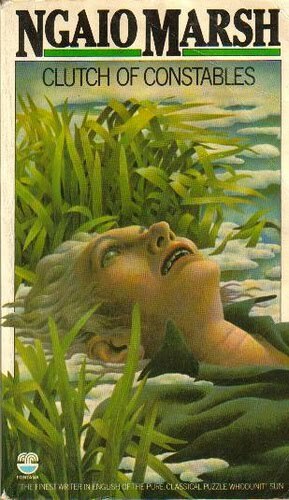 I've got so many Ngaio Marsh books now I've actually started collecting cover illustrators - how sad is that?! I love this book! Read all of Marsh's Alleyn books earlier this year and loved most of them. She really was/is a terrific writer.